The Central government and the states are continually skirmishing with each other over the GST - or land acquisition, or water, or mining, police... the list is long. Here come a few solutions. The Central government and the states are continually skirmishing with each other. If it is not Arvind Kejriwal vs Najeeb Jung in Delhi, it is the Union government vs the Rest over the GST - or land acquisition, or water, or mining, police... the list is long. So, whither cooperative federalism, so that the country can move forward more quickly, asks Vidhi, a legal policy advisory group set up a team of young lawyers. Its other name is Centre for Legal Policy. It has proposed a set of solutions in areas of centre-state jurisdiction trouble such as ecommerce, land acquisition, GST and redesigning Delhi's governance. 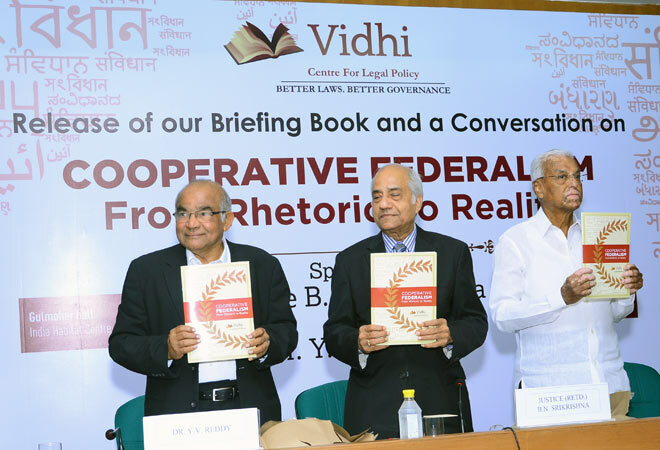 The solutions are available in a briefing book Cooperative Federalism - From Rhetoric to Reality that was released on Wednesday evening in Delhi by former RBI governor and Chairman of the 14th Finance Commission Y.V. Reddy, Justice B.N. Srikrishna, former judge of the Supreme Court who headed the Sixth Pay Commission and the Committee on Telengana, and Ashok Ganguly, former Chairman of Hindustan Unilever. On Goods and Services Tax (GST), Vidhi proposes that the 2014 Amendment Bill may be modified so that the GST Council's role is strengthened. The bill should state that "The Council will take decisions that are binding on the Centre and States". Currently, there is scope for confusion as to whether the recommendations of the Council are binding or not. Another modification is "Where consensus is not possible within the Council, a decision should be taken by three fourths majority with each state and the Centre getting one, non-weighted vote." Finally, if either state or Centre is aggrieved, it may challenge the recommendation before the Supreme Court under Article 131 of the Constitution. But on GST, Reddy, who as head of the 14th Finance Commission had recommended an unprecedented increase in the share of tax revenues transferred from Centre to the States, gently chided the gathering against growing too frustrated. "I understand the frustration in the delay of GST adoption. But when you look back to 50 years ago and what a mess our taxation structure was, we have come a long way in rationalising taxes." Reddy, who was at his humorous best, recounted his experience of Centre-State perceptions in the early 1970s. He was with the planning department in Andhra Pradesh, and had also been made a member of the task force on decentralisation of the central Planning Commission. It was a formidable body then with stalwarts like laconic Sukhumoy Chakravarty and the acerbic B.S. Minhas. "Once during one of our meetings, Professor Minhas told me - We find that planning is best in Andhra Pradesh but development is best in Punjab where there is no planning." That put me in my place, Reddy said. Another gem was from 1983 when N.T. Rama Rao was elected chief minister of Andhra Pradesh. The debate raged in the planning department whether to allocate more funds for ongoing projects or to set aside more for new projects. At this point, a wag remarked: "If the public wanted the old projects to go through, they would have voted for the existing government. Clearly they want new schemes and hence voted a new government." "Many people tell me I am very pro-states, but it's not true. I am equally indebted to the Union government," said Reddy. Justice Srikrishna said that cooperative federalism was "an elastic term" and there is a flaw that is rather visible as the boundaries of power sharing between Centre and states have never been properly defined. Moreover, for true cooperative federalism, you need strong states but history has shown that states have never remained indestructible in India. "So many states have been formed, reformed over the years," he said. However, he said the flaw - of not defining power sharing - may prove to be a virtue, as it gives flexibility to both Centre and states in their dealings.